almost due north with the land sloping down toward the sea on the right. The Santuari de la Mare de Deu de la Cisa is a small church with an austere baroque facade located in the town of Premia de Dalt. The church sits part way up the slope of the Serralada Litoral, a range of low mountains north-east of Barcelona, and overlooks the Mediterranean. It is home to a small statue of the Virgin Mary and Christ that during several hundred years has been an object of pilgrimage and veneration by fishermen, sailors and mariners from various towns along a stretch of the Catalan coast. Like many Catalan churches, la Cisa, as it is known colloquially, has been damaged and rebuilt various times over the last thousand years. The most recent attempt to destroy the church occurred in July 1936, a few days after the start of the Spanish Civil War, when a group of itinerant church-burning anarchists passed through the area. Although most of the interior decorations were destroyed the building itself remained intact and the Virgin and Christ also survived. However, a large collection of ex votos, that had been acquired over the previous three centuries, was almost completely lost. The loss of the ex votos was significant not just in terms of the physical loss of the item but also because each ex voto told a story of suffering, heroism and survival at sea. At first it may seem odd that a church three kilometres from the sea and located on the slope of a mountain should be associated with mariners. From the grounds of la Cisa there is a fine view of the Mediterranean coast extending from the harbour of Premia de Mar all the way to Mataro. For hundreds of years there were few towns or villages directly at the water's edge over the length of the Catalan and Valencian coasts. The few towns with waterfronts were protected by high walls and had elaborate defences. This situation was a result of the fear of attack by Muslim pirates who ranged from the Algerian and Moroccan coasts. Most towns were set back from the sea. The fishermen would of course keep their boats down by the sea and perhaps put up a few simple buildings but they made their homes inland or on the slopes of the overlooking mountains. When the pirates finally disappeared in the late 1700s upland towns established suburbs on the coast. Usually, the groups of fishermen's shelters would form the nuclei of those suburbs which later became towns of their own. Along the coast northeast from Barcelona there are several towns that share names indicating a common origin. 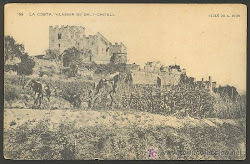 For example, Vilassar de Dalt--literally Upper Vilassar--is more than a thousand years old while its sea-side namesake Vilassar de Mar--Vilassar by the Sea--is only about two hundred years old. The Cisa's town, Premia de Dalt, has a seaside counterpart in Premia de Mar. So while the risk of sudden seaborne attack persisted, churches would have been built on the mountain, preferably somewhere with a good view of the sea. 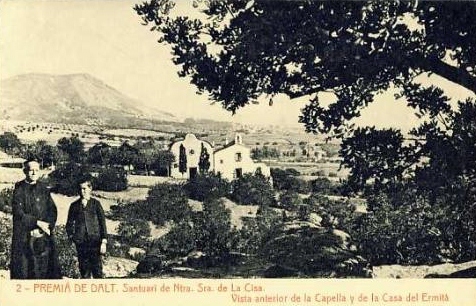 The original church on the site of la Cisa, was according to a legend, built on the spot where the statue of the Virgin Mary and Jesus was found by a young shepherdess. The wooden statute is about 30 centimetres tall and it portrays the Virgin seated on a throne with the Christ child sitting on her left thigh. The style is Gothic and perhaps the statue dates from the 13th century. Very likely there was some sort of religious structure on the same site that pre-dated the discovery of the statue. By the 16th century la Cisa was attracting fishermen and sailors who came to make votive offerings after some near disaster at sea. Gradually the association between the Madre de Deu de la Cisa and mariners grew stronger and the collection of ex votos increased until the walls of the church were covered in them. The dangers faced by mariners could be storms, pirates, accidents and acts of war. The first of May came to be an important day for la Cisa with a feast and gathering that brought together mariners and their families. A procession would be the highlight of the festival followed by picnics under the trees of the church grounds. It is a tradition that continues even if the numbers of fishermen are not what they used to be. There are different styles of ex votos but most were in the form of paintings, usually oil on wood, depicting the events of the sailors’ near appointment with destiny. There would be a short note explaining the circumstances of the event along with the name of the vessel and the names of the captain and sometimes of the crew. Other ex votos were more akin to folk art than to fine art but that does not diminish their artistic and historic values. In the case of ship models they were sometimes hung from the church ceiling. A final type of ex voto consisted of what is known as a half-model, where only one side of the ship is constructed. Half-models were usually mounted inside a glassed over frame to be hung on a wall. By chance, sometime ago we acquired an ex voto dedicated the the Virgin of la Cisa. We found it next to a garbage bin here in our town, Vilassar de Dalt. Presumably someone had thrown it out without realising or caring about its significance. Our ex voto is of the half-model type. The ship it depicts is a three-masted schooner and in this case the artist had some technical skill as the model is quite well done. Perhaps it was made by a crew member whose hobby was making ship models. Not only is the schooner well proportioned but it carries a suit of sails and the rigging is relatively accurate. fronte al cabo de Lastres a bordo del pailebote Ernesto Mas. While off Cape Lastres on the Cantabrian coast facing the Bay of Biscayne, the schooner Ernesto Mas was struck by a gale and the crew invoked the help of the Virgin of la Cisa. Obviously they lived to tell the tale. I did some research in the library of the Maritime Museum of Barcelona but was unable to find anything definite about the ship or her captain. There was no record of the schooner Ernesto Mas. I did not find any reference to a Captain Jayme Alsina although the surname was very common amongst mariners from the nearby towns of el Masnou and Premia de Mar. In Catalan the name Jayme would have been written as Jaume and even then I could not find an exact match of the name. However, considering that the Alsina name is so common in the Maresme comarca (county) and that the ex voto is dedicated to the Virgin of la Cisa, the ship and crew were very likely from the area. The earliest ex voto known to have been donated to la Cisa dated from 1689 and with it a Captain Josep Sala gave thanks for winning a sea battle against some Dutch pirates. Captain Sala's offering was of course lost in the civil war. Even without the intervention of the war many of the ex votos in la Cisa were by 1936 already in very poor condition suffering from the effects of time. Many consisted of oil paint over wood panels and they did not keep well. A few of la Cisa’s ex votos have survived and are now in the collection of the Barcelona Maritime Museum.